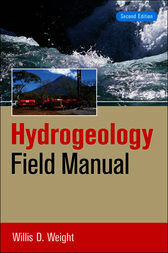 The Second Edition of Hydrogeology Field Manual provides the latest information on applied applications in groundwater sampling and water-quality assessment, aquifer characterization, contamination issues, karst applications, and more. The book includes actual procedures, real-world decisions, and many examples and case studies to help you understand the occurrence and movement of groundwater in a variety of geologic settings. If you are still in college, a recent graduate, or a working professional needing a ready reference to assist you with field-related matters, this is your book. Experienced hydrogeologists and those in related fields will also welcome the practical time-saving and trouble-avoidance tips. Willis Weight is head of the Hydrology Program at the Department of Geological Engineering at Montana Tech of the University of Montana.